Oh what a morning I had! I say that in the best possible way. You see, last week, I lost a sock. Not a kids sock, but a Mama sock. A Mama sock without any holes in it. That my friends is a big deal in this house, because, as it turns out, most of my socks have one, or several holes in them. I hate wearing socks with holes in them, but as I have very few pair that are intact, I have to make due with what I have. But, I digress. I spent the better part of last week looking for said sock (did I mention it's pale pink with cute polka dots on it, and the toe and heel are periwinkle? Do you see now why I just had to find it?). I went thru all the clean and dirty laundry, looked under beds, under the washer and dryer. Still, no sock. 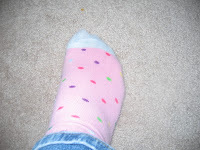 It became an obession that went something like this: "Meg, have you seen my polka dot sock?" "Drew, have you seen my polka dot sock?" "Doug, what did you do with my polka dot sock?" WOW. I had so many other things to obsess about, like my other home needing a tenant ASAP, and the state of my kitchen, but I focused my energies on that darn sock. After doing laundry again this weekend, said sock was nowhere to be found and I was pretty sad. But this morning, I triumphed! I decided to go thru the twins' bureau, just in case. Guess what I found? Oh come on, guess! You're right~my sock. Sitting on top of the girls' jammies in the bottom drawer of their bureau. I held it up high and yelled "I found my sock!" like I'd found a million dollar check hidden in there. Who knew that such a little thing could make me so happy? Then my husband came home at lunch and made fun of the gray streaks in my hair, and that hapiness just went away. He did tell me that I "should go get that colored right away" as if that made things better. I know he meant well. However, I am just reminding him that he can end up in the doghouse with Swistle's husband, so he best be careful. You are hilarious!!! Thanks for making me laugh anyways. I've felt like a loser in the past writing a whole blog post about vacuuming, but I think you've got me beat with a whole blog about your polka dot sock, not that I think you're a loser because I don't. Anyway though congrats on finding your sock!!! So -- what sock size are you there? It sounds like the sock fairy should come to visit you. When sox go off and get religious, I just break the Commandments and steal my father's. Even at this age, I still swipe 'em when I go and visit. Hello. I'm Auntie Nettie and I'm a sockklepto. I heard that the Easter bunny was now making sock deliveries. Would you like some cheese with your whine ma'am?